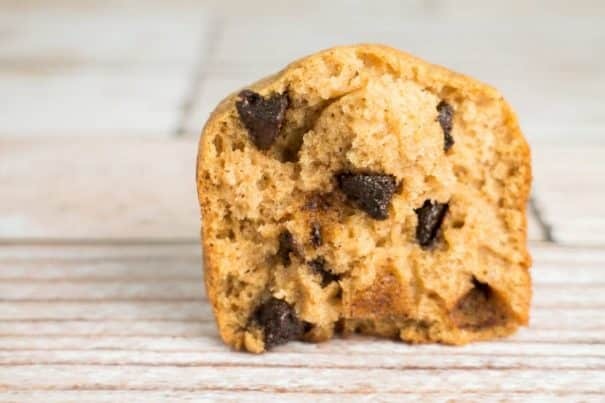 Moist and DELICIOUS Pumpkin Chocolate Chip Muffins! You won’t believe how easy this recipe is! My family considers these the best pumpkin desserts! These are easy to turn into a gluten free recipe too! Want to watch a video of me making this recipe? Check it out here! I’m on a muffin kick right now. My favorite muffins of the moment are the Fluffy Chocolate Chip Muffins and these Pumpkin ones. I swear they can’t last in my kitchen with me around. These chocolate chip muffins here make for a happy breakfast. For this chocolate chip muffins recipe, I’m using brown sugar instead of regular white sugar. I find that brown sugar adds a bit of a depth to muffins and brownies. I start by mixing my wet ingredients. Later in I sift the dry ingredients and combine it with the wet ones. I have added cloves, cinnamon, and nutmeg in my dry ingredients. That’s why these chocolate chip muffins are bursting with flavor and some sweetness. Add in the chocolate chips to the batter. Pour into a muffin tray. For added goodness, I sprinkle in chocolate chips at this step too. This makes the chocolate chip muffins look so much better when they come out. You can instantly see the chocolate chips. So much eye-candy!